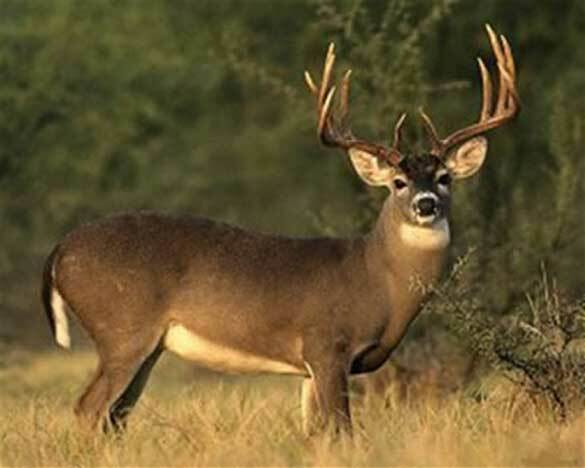 I had spent most of the summer watching 3 mature whitetail deer in the thirteen hundred foot tall hills in southeastern Oklahoma. All three of them had been using well worn travel paths, along the tops of the hills, hitting the corn that had been put out, but mainly eating on the abundant acorns that the mature oaks nestled up on high had been producing. Almost as if a magical clock had rung its bell, they all disappeared in mid October, leaving only a few small bucks, some does, and a massive army of pigs in their place. Bow season had started up, and the big boys that we had been watching had vanished. My first thought was that the pigs had run them off the land that we were hunting. Seeing as one of the boars that seemed to show up at every stand was in excess of 400 pounds, I wouldn’t want to stay around either. After the last three bow hunting trips I’d gone on, not seeing one single deer, I decided to do some in season scouting of the property that I was on. Coming off the tops of the hills, armed with my bow, some topo maps, and a light rain to mask my movement, I worked my way around the funnels and creeks that run throughout the property. The upper areas that I had been setting up in were open areas, with grand oak trees interspersed with mature pine and cedar trees. The bottom areas were the exact opposite, thickets and immature stands of thick pine groves that would not support any kind of stand. It was at this point that I made my discovery, one that fired me up for my next set of off days to hit the woods again. 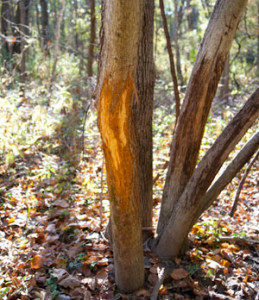 In the bottom part of where three hills converge I found a rub line in an immature stand of pines, a rub line that would have excited any hunter. Along with a multitude of trashed young pines, every other brush and small tree in the area had been either rubbed and some even pushed into the ground. The damp ground also gave up signs of many big whitetails, and the tail tale sign of where our deer had turned to spending their free time. As I looked at all the new sign that I had stumbled upon, I soon noticed that there was no good trees to hang a stand or to lean a ladder stand against. No despair came over me though. I knew that it was time. Time to break out my ground game. Time for some eye to eye hunting, on their level, mano a deero. A new excitement came over me as I packed my way back up to the camp to load up for the drive home. “Time to break out the ghillie suit” I happily exclaimed to my wife when I got back home. “You didn’t see anything again?” as she smirked at me as I started unpacking my ghillie suit and prepping it for the next hunting excursion that I was already planning. “Its time to get on the ground and go after them, like the one that you helped me get loaded up when we lived up in north Iowa”. It was going to be at least another week until I could make the three hour drive back to my land to hunt, due to work, but in my mind I was already working up my to do list for the next adventure. As I sat in the middle of the living room floor I asked my middle daughter to go get the vacuum cleaner as I picked out briars and leaves out of my suit from the previous years hunt. Picking out the leaves brought back lots of previous hunts memories. 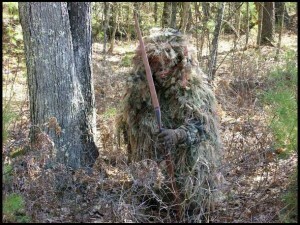 You may be thinking ghillie suits and a traditional bowhunter magazine? 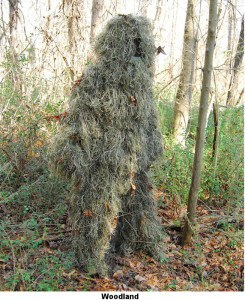 Ghillie suits have been used for over a century, used by Scottish game keepers to fend off poachers and to look over their Lords game. The game keepers even developed tactics so that while wearing their suits they would grab game as it passed by them, and take back to their Lords castles for them to hunt in their courts. The suits were eventually developed into tools for military use, and about the only difference in the suits that are used by our military snipers presently and what the Scots used, is the materials that are used to make them. My first suit was of the home made variety. I went to my local army surplus store and purchased a one piece flight suit, and a roll of netting. The next stop was to the craft store where I purchased jute twine, clothes dye, and several rolls of dental floss. I must have spent forty plus hours of sewing netting, and the taking strands of different colored jute and tying into the netting until the entire flight suit was covered. 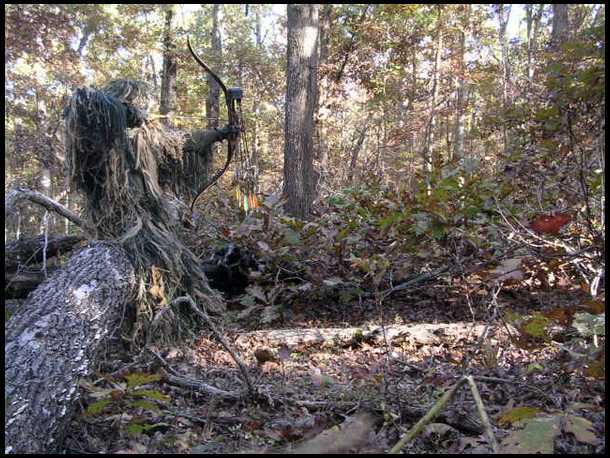 I never used the suit for bowhunting though, at the time it was my varmint hunting suit. One of the advantages of the suit that I made was that it kept me plenty warm during the coldest part of the winter. But as one could guess, it was almost unbearably hot when the temperature got above freezing. As a birthday gift one year, my wife purchased me a new camouflage outfit, one that was made with “leafy” pieces of fabric sewed into it. Not quite a ghillie suit, but it served its purpose. Many years later, I would get my original suit out and attempt to use it for bowhunting, only to learn that the additional thirty plus pounds that I had gained from weight lifting, rendered it too small for me. It eventually was donated to a co-workers son that developed an interest in varmint hunting. In 2009, at the peak of the whitetail rut in North Iowa, I had permission to hunt a corn farmers land. 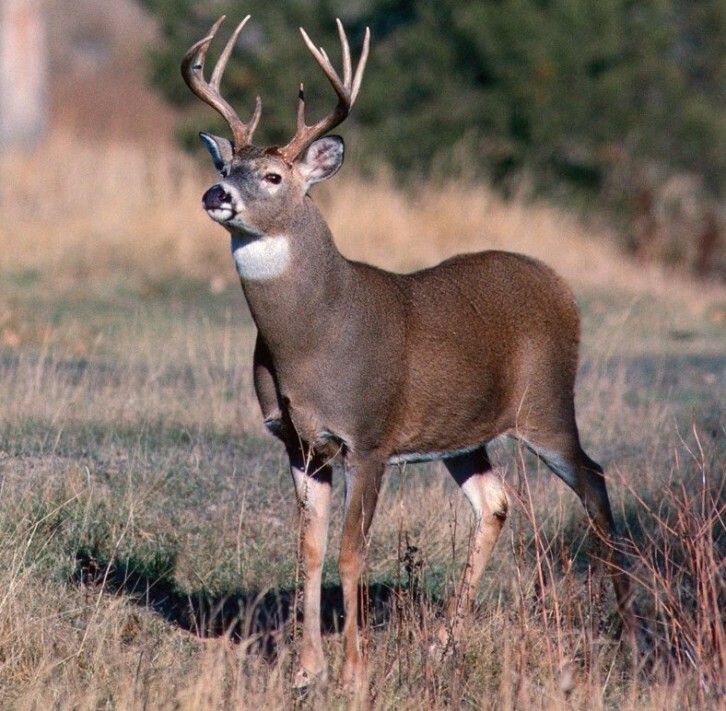 A few days after he had harvested a field of corn, I spotted several bucks running does in the open fields. The situation presented itself that I could set up on a fence row that had about a ten foot width of underbrush running its length, dividing the cut corn field and a grass field. The deer were using this as a travel route and they had created a super highway trail right down the center of this fence line. At the time, I was using my leafy suit, and almost the same situation presented itself that I face today, no trees to get up in the air in. So, I took a small stool with me, a buck decoy and armed with some parachute cord and some handheld pruners, I fashioned me a very crude ground blind on the fence line. As the sun came up that morning, the wind started to blow right into my face from the direction of the corn field. It was very cold that morning, and with the wind blowing it was down in the single digits. At around 8:30, I had decided that the cold was going to win out on me that day, that’s when I saw a buck chasing after a doe. My adrenaline started pumping as I watched them for over 45 minutes, several hundred yards out in the corn field. They would stop running and from where I sat, you could see the steam rise off of them. The chasing and stopping seemed like it lasted an eternity but as soon as it all started it was over with. Both the buck and doe disappeared from my vision. As I sat there, I started thinking of packing all my gear back to the truck, which was about a mile away, and that’s when I heard it. I loud thump just eight feet to my left. I slowly rolled my eyes in that direction and there he stood. The eight point that had been chasing the doe earlier, and he was standing right next to me. He was intently focused on the buck decoy sat up out in his corn field and he was none too happy about it. He had both ears laid back on his head, and all the fur along his spine was raised up on end. He had no interest in me being there at all, as he quartered right in front of me, positioning himself between me and my decoy. At six feet, I drew back my bow and sent my G5 Montec tipped Gold Tip arrow straight through the buck. The arrow landed out in the corn field some forty plus yards away! The buck trotted over to where my decoy was set up, blood pumping out both sides of him, and using his last bit of effort, ran his antlers into the side of my decoy. That was the last step he took. I called my wife and hardly able to breathe told her, “get some warm clothes on; I am coming to get you”. 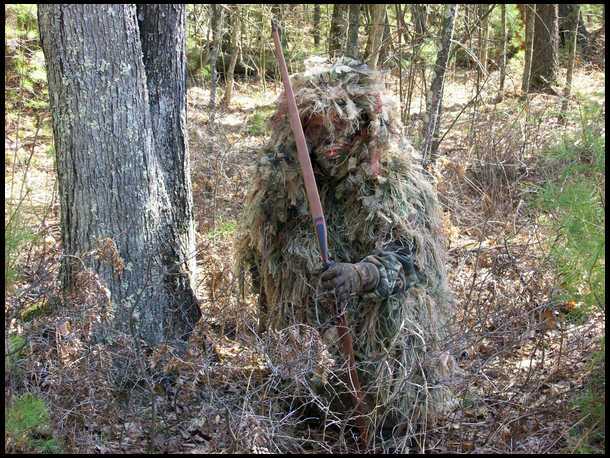 That was the start of my love of hunting from the ground, and utilizing a ghillie suit in my tactics. During the 2013 bow season in Texas, I had a chance to hunt a friend’s property in West Texas, Even though there were plenty of trees to hang a stand from, I still chose to get up against a mesquite tree that had some brush growing around it, and I got myself set up on the ground. This time, I was wearing a ghillie suit made specifically for bowhunters. This one is designed so that the bow arm does not have any strings or other material that will catch your bow string once you draw or release your arrow. This suit was also bought for me by my wife (see the developing pattern that camo makes a good present for me!). On the second day of the hunt, I had in excess of twenty deer surrounding my location, with eight of them being 8 pointers or better. I severe case of buck fever took over me and at 16 feet, I sent an arrow a foot over the top of a really nice 8 point. Even though there was no deer loaded up, it was still very exciting to be experiencing hunting in this fashion. My years of hunting from the ground and especially with a ghillie suit have taught me many things that I would like to share. First and foremost, if you make or buy a ghillie suit, absolutely stay away from flames, and consider the use of some type of flame retardant product on your suit. You do not want to be caught in one of these suits if it ignites. The many different types of fabrics and strings used could potentially be like dry tinder igniting should a flame get too close you. Second, I like to keep my suit as scent free as possible. I always use a scent free detergent, washing it in a 5 gallon bucket, and letting it hang dry outside. If you want to make your significant other extremely upset with you, go ahead and wash and dry your suit in the washing machine and dryer. Don’t ask me how I know this tidbit of information. In addition to keeping myself and my underclothes as scent free as possible, I also spray my suit down with scent killer before going in the field. Hunting on the ground you often lose the advantage of having your scent blow over animals as you would in a tree from an elevated position. My last piece of advice is about getting into and out of your hunting areas with your suit. The suits are designed so that everything in the woods sticks to them. That means, briars, mesquite branches, leaves, small insects and rodents, everything. About the only thing that I have not had stick in my suit is rocks. But I am not discounting that not happening either. My solution to this problem is that I simply roll my ghillie suit up into a tight roll and attach it to my backpack. Once I get to my hunt location, I take a few extra minutes to get into it, and then the hunt is on.